As an adaptation to minks' aquatic lifestyle, their feet have semi-webbed toes and oily guard hairs that tend to waterproof the animal. Members of the Mustelidae family in Alaska include weasels, martens, wolverines, river otters, and sea otters. Mink are known for their fur which is in prime condition when guard hairs are thickest. Mink are then a chocolate brown with some irregular white patches on the chin, throat, and belly. White patches are usually larger on females and often occur on the abdomen in the area of the mammary glands. Several albino mink have been reported from Alaska. Underfur is usually thick and wavy, not longer than an inch. It is dark gray to light brown in color with some suggestion of light and dark bands. The tail is one third to one fourth of the body length with slightly longer guard hairs than the body. As an adaptation to their aquatic lifestyle, their feet have semiwebbed toes and oily guard hairs that tend to waterproof the animal. Adult males range in total length from 19 to 29 inches (48–74 cm). They may weigh from three to almost five pounds (1.4–2.3 kg). Females are somewhat smaller than males. Their movements are rapid and erratic as if they are always ready to either flee or pounce on an unwary victim. Like skunks, mink discharge a fetid liquid from their scent glands when they are afraid or excited. The odor is very strong and unpleasant to most people. In Alaska, northern mink breed about two weeks later than those further south, because onset of breeding is determined by daylength. The breeding season extends from March through April, depending on the latitude. Males and females may breed with more than one other mink. The young within a single litter can be the result of fertilization by different males and/or two different ovulations more than a week apart. The total gestation period varies from 40 to 75 days. In mink and other weasels, the fertilized egg does not attach to the uterus to develop right away as in most mammals. This delayed implantation accounts for the great variation in length of the gestation period. Once the egg implants, fetal development takes about 30 days to complete. In Interior and western Alaska most births occur during June. Differences in the abundance of food available to the mother affect the number of young born and the number that are weaned. Litter size varies from four to 10 kits. The den is generally a burrow or hollow log near a pond or a stream. In most cases the den used has been constructed and deserted by other animals. At birth, newborn mink are about 0.35 ounces (10 g) and slightly haired. Young mink remain in the den about a month. They grow rapidly and attain their adult size by September. In the following spring they may breed and raise their own young. Mink will eat virtually anything they can catch and kill, including fish, birds, bird eggs, insects, crabs, clams, and small mammals. There are both seasonal and annual differences in the diet depending on what is available. Mink prefer streams, ponds, beaches, or marshes. An abundance of hares or mice may cause them to move inland. Adult mink have been known to kill and eat young mink. Little is known about the overall effects of other predators on mink populations. Occasional predators of mink include wolves, foxes, hawks, owls, eagles, lynx, and river otters. The relationship between otters and mink is unclear. If there are otters along a stream, usually they will not tolerate the presence of mink within their territory. 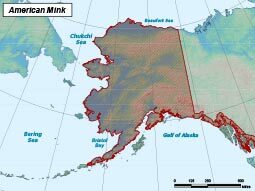 Mink are found in every part of the state with the exceptions of Kodiak Island, Aleutian Islands, the offshore islands of the Bering Sea, and most of the Arctic Slope. Mink are found in close association with water, preferring saltwater beaches, riparian habits of lakeshores, marshes, and stream banks. In Prince William Sound coastal mink selected sites with shallow vegetated slopes and tidal slopes with some protection from wave action and some overstory cover. On Prince of Wales Island, coastal mink use residual beach-fringe, old growth timber, and intertidal habitats. 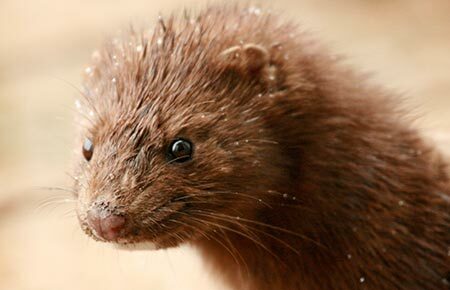 Most recent ADFG furbearer report indicates mink are stable or increasing in most game management units. Little is known about threats to mink populations, but overharvest and loss of habitat would be factors. Throughout the state except Kodiak Island, Aleutian Islands, the offshore islands of the Bering Sea, and most of the Arctic Slope. Fish, birds, bird eggs, insects, crabs, clams, and small mammals. Wolves, foxes, hawks, owls, eagles, lynx, and river otters. Breed annually, females give live birth to 4–10 kits.